Valentines is around the corner. The famous gift that couple uses to gift and receive from one another is CHOCOLATE! 🍫 I was glad to have the opportunity to visit Harriston Chocolate at Taman Shamelin Perkasa. What’s more interesting is that I got to make my own chocolate at their DIY Workshop. The place is very easy to be spotted. If you found yourself looking at a building cover with beautiful art of cocoa tree, you know you’re at the right place. About Harriston Harriston is a brand that is born and breed in Malaysia. It was established by a group of talented and dedicated chocolate makers who owns Harriston Artisan, Harriston Boutique and Harriston Signature. Harriston is founded in 2005 by S.C. Teng, a man who spend his childhood till now loving chocolate and envisaged a world famous chocolate emporium in Malaysia. Do you know? Now Harriston is one of the largest homegrown chocolate makers who have served over more then 4 million customers from over 80 different countries around the world. What’s more? It also own 5 flagship store around Malaysia which include KualaLumpur, Penang and Pahang. Store Tour Upon arrival we were brought and told about the history and achievements of Harriston. Here are the achievements achieved by them. We were then told and explain how chocolate was made. It was interesting to me, looking at the pictures and knowing how it was made, which is something new to me. Since young I’ve been in love with chocolate and eating them but never did I know the process of how it was made step by step. There are basically 3 types of chocolate which usually come across. That would be Dark Chocolate, White Chocolate and Milk Chocolate. There were also many fun facts that were shown to us by Mr Shahrel. He is one of the friendly staff that show us around throughout our whole visit. The chocolate that Harriston uses to produce their chocolate is none other than 100% pure cocoa butter and ingredients that have gone through special selections in adherence to ISO 9001, HALAL certificate requirements. In addition, rigorous quality control and international hygiene standards have been follow to ensure the freshness, quality and variety can be found in all of their outlets. As many of you know, one of Malaysia most popular fruit which is Durian, can be found in store. It is because Harriston provide more than 300 variety of choices to choose from. There are mixture of dark and white chocolate, to one of the classic flavour tiramisu to exotic fruits and herb flavour which you might not be able to find elsewhere. Such as Tongkat Ali chocolate and like I mention above, Durian chocolate. In order to serve all of their customers, they even have sugar-free chocolate for health conscious people. You can visit Harriston anytime. There are many testers to taste all their unique flavours. Just walk to each section and their friendly staff would walk up to you with their sample. I am quite sure you have never tried curry or even chili 🌶 chocolate. I was really surprise when I heard and tried out those flavours. You can feel the curry taste in your mouth or even that hint of spicyness after swallowing the chili chocolate. After having so many chocolate to taste, we couldn’t forget about beverages! They serve really tasty chocolate drink that would make you crave for more after having just one cup. You can taste the richeness of the chocolate all in one cup. DIY Workshop Harriston provides diy workshop for anyone who is interested in making their own personalized chocolate. They provided each of us certain materials and mold. Demo and instructions will be given by one of the friendly staff. The directions are very straight forward and clear. It’s really fun as it was my first time making my own chocolate. The workshop is open to public for ages above 3 years old. The diy session would be hands on work which would also depends on your own creativity. Each session would be around an hour long and would cost only RM35. It would be something meaningful to bring home with. A memory that you can keep and bring along the art that you created. In the process of making my own hands on chocolate. My masterpiece 😂 I tried, it’s not as easy as the demo, needs a lot of controlling and patience. Overall it was a really great experience and I really had fun during the diy workshop along with exploring lots of new flavours of chocolate. Here’s a groupie! Planning to have lunch at somewhere unique this weekend? This is not your usual restaurant where you just have your meal and head out when you are done. This is Hornbill Restaurant located at Kuala Lumpur. What makes it stand out from the other places is you get to enjoy your meal along with beautiful birds such as the Hornbill. It is a rare experience to have lunch or dinner with birds chilling right beside of you. The restaurant serves a variety of mouth watering foods. All of them are sold at affordable prices and it tastes ‘wildly’ amazing! They provide both outdoor (suitable for bird watching and environment lover) and indoor (people who prefer a cooler place to dine in) atmospheres. Here are some of their Asian Delights that are very popular from this restaurant. 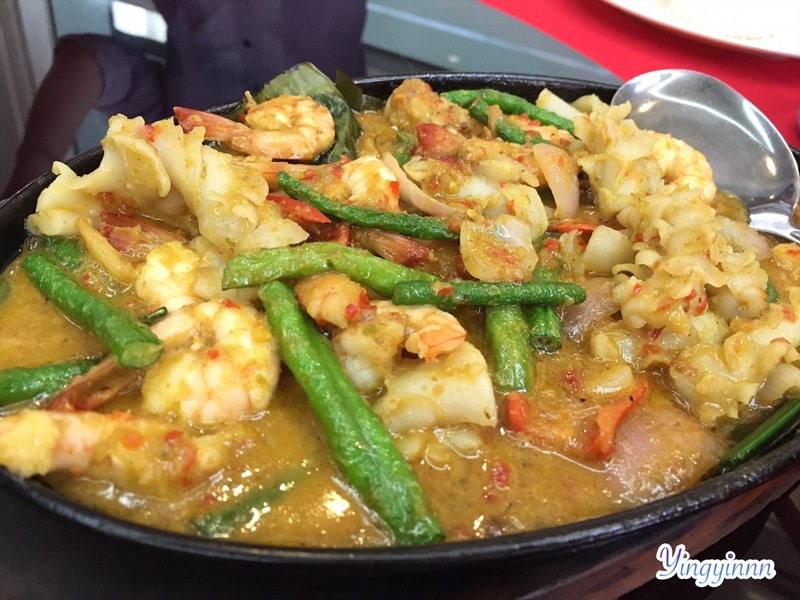 If you are an explorer or a tourist planning to visit Malaysia, be sure to drop by and have a bite of Malaysia’s favorite dishes. Spicy Chicken Curry served with a plate of steam white rice and papadam. Stirred fried yellow mee with beancurd, eggs, chickens, seafood and potatoes in tomato & dark soy sauce. Stirred fried kuey teow with chickens, prawns, eggs, bean sprouts and chives. Rice vermicelli served in coconut curry broth with shredded chickens, prawns, fresh coriander, beansprout, lime and homemade belachan chili on the side. Glutinous reddish brown speckled rice served with tuna fish curry and sliced vegetables. Grilled chicken chip served with black pepper sauce, sautéed vegetables and wedges. Classic spaghetti cooked in aglio olio style. You can choose from seafood RM25.90, beef bacon / chicken RM23.90 or vegetarian RM20.90. It can either be eaten with or without honey. I personally prefer with the honey. Overall the food was really delicious. All the pictures as seen above are original as well as the portion served. Not to mention they also have a wide array of drink selections to sip in. Got myself a cup of fresh watermelon juice. If you are an Instagrammer and always looking for places to take a beautiful greenery picture filled with ‘flora and fauna’ then this can be one of the places to add into your list. There might be monkeys there which, of course, are curious to visit you. Ever thought of having French cuisine one day after feasting your eyes with delicious French food on television or even on reality show? Do not have the money to travel there to enjoy their mouth watering dishes. Guess what, you can try them now at a French Restaurant located in the heart of Kuala Lumpur. They serve from main dishes to pastries that can guarantee you will fall in love with. And I have GREAT NEWS! Chez Lèoniel came out with an afternoon Hi Tea set that is really suitable for pastry lovers. You can have your Hi Tea at Chez Lèoniel every week without any worry as they changes their Hi Tea set weekly! brasseries also add Béchamel sauce. Gratin dauphinois is a traditional regional French dish based on potatoes and crème fraîche, from the historic Dauphiné region in southeast France. There are many variants of the name for the dish, including pommes de terre dauphinoise, potatoes à la dauphinoise and gratin de pommes à la dauphinoise. I was glad to be invited by Chef Leoniel DG to try out their Hi Tea set along with 3 of my friends. So here’s a picture of what we got for our set. Remember please do not expect the exact same pastries for your Hi Tea set when you visit as they changes their Hi Tea set weekly. For the Fruit Panier, they serve in 4 different flavour. Not sure what flavour is it, but from my perspective there is Mango, Raspberry, Strawberry and I have no idea. Haha! But trust me, it is really delicious. They wrap the filing really well with croissant. Neither its too soft nor too hard, just perfect. As for the Apple Turnover, its equally tasty as well. The apple filling was wrap in croissant as well if I’m not mistaken. Out of this 3 pastries, my favourite would be Pain Au Chocolat. This pastry is basically croissant fill with chocolate on the inside. Not too much, but the right amount of chocolate which its just right for the pastry. Next, Macaroons which comes in 2 flavours. You can either share half with your partner to try out both flavours or each of you pick out your favourite flavour. Financier is a type of cake origin from France. There are 4 pieces which includes 2 original flavour and 2 almond flavour. My favourite for this tier would be their Quiche Chicken Ham and Cheese. There is cheese on top and ham on the inside, something you would truly like I believe. Oh and the crust was just nice, not too thick or too thin. Next on the plate was Croissant, this time you will get the chance to try out their original croissant without any filling. Lastly would be their Apple Pie. They slice it in the shape of a pizza, really adorable and instagram worthy. All in all it was a great experience. I forgot to mention that we had Red Fruit Tea, it goes perfectly well with the pastries. In my opinion you can actually have 2-3 pax for the high tea if its all girls. Please take note that their location is a bit complicated, but you be able to find it by having the correct address. You can find the place by either choosing the few address below in waze, ‘Alliance Francaise’ or ’15 Lorong Gurney’. Once again thank you Chef Leoniel DG for the invites. The company was founded in 2012, at the very beginning he started taking orders and making them at home while attending French language classes at Alliance Française de Kuala Lumpur. The reason why he chooses to learn French it is simply because it makes it easier to translate those French recipes and by learning the language it makes life easier while wondering about the cities in France. Chef Leoniel has found his passion in the culinary world by travelling around the world. He was a flight attendant for almost 10 years. He enhances his skills at Le Cordon Bleu and continues his pursuit of excellence by attending workshops periodically. According to the chef he believes that “It is indeed the passion that makes a different to what you serve to your customer”. Do you crave of having buffet for lunch or dinner but afraid the price may empty your wallet? 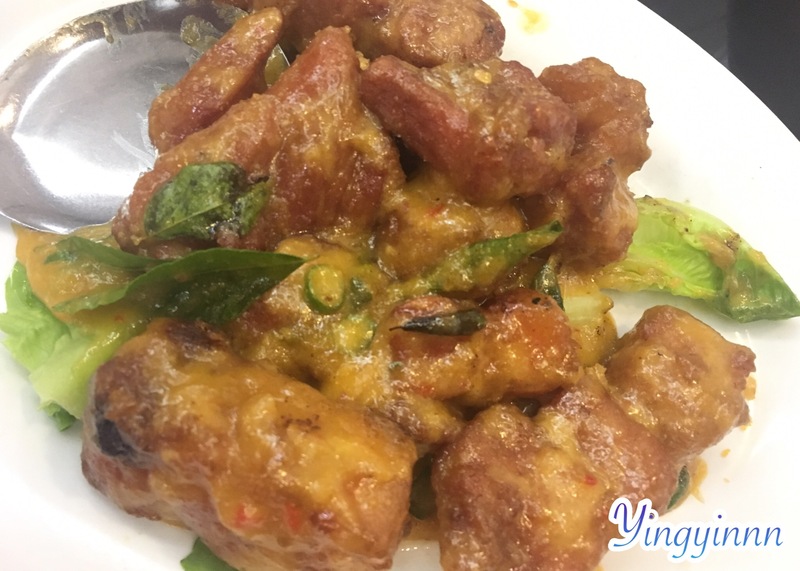 Always have the hesitation of should I go today or another time, moreover that you might not be able to eat a lot but feel like trying out all this dishes from the menu. I think I might just have your back cover for ya! San Nae Deul Bangsar South is your next destination for korean buffet lunch or dinner. They offer a variety of choices to choose from, whatever you can usually find in a korean restaurant, you will most probably find it here. Their choices comes from Pork, Chicken, Beef to even Seafood. If you are a fan of korean food lover, trust me, you will fall in love with the place. There are 2 types of buffet to choose from, either Korean Buffet with BBQ or Korean Bufffet without BBQ. This options includes all you can eat foods from the food bar that you can see once you enter the restaurant. They will give you a bento plate like you can see from the picture above. You can fill your plates with all the delicious food that were provided as many time as you like, its buffet after all. Here are some of the foods that you can choose from. Not to forget they have an ice cream machine for ice cream lovers. The machine can be found near the entrance of the restaurant. As for drinks, they have few of Malaysia favourites which includes Lemonade, Orange and Green Tea. What makes it special is you can fill the drinks in their special LED light bulb cup. It changes colour continuously which is really popular among teenagers as they love to take picture with it as well as videos and for their social media. This is what you can eat if you include BBQ, the meat choices includes chicken, pork and beef. 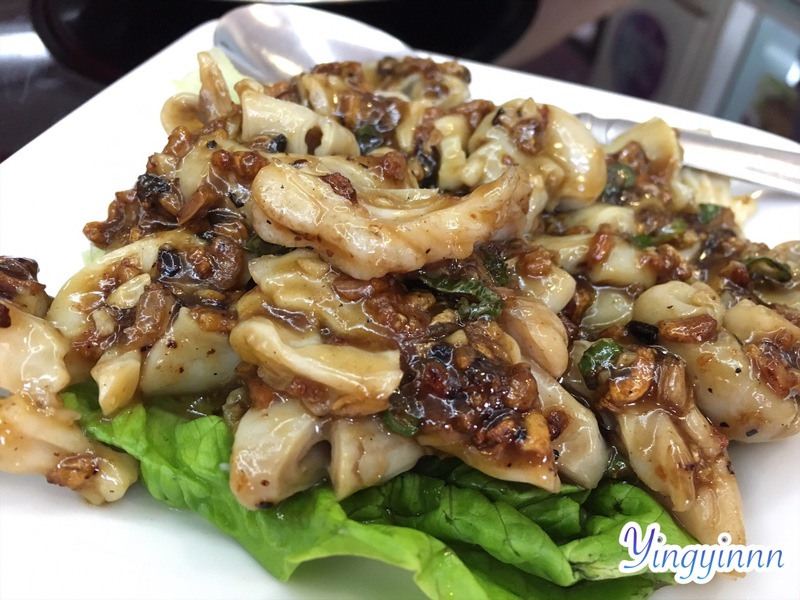 There is just plainly meat available or you can choose the meat that are marinated as well. For me, I really like their marinated meat. Not to forget, the marinated meat with curry is delicious. Trust me. After eaten once, you would order a few more plate not knowing if you will get over it. All BBQ set comes with a free plate of cheese for you to dip in. So for the BBQ set, you will get to enjoy everything that I mention above. It includes the food bar from fried chicken, fried mushroom, korean pancakes, rice cake, kimchi fried rice, korean glass noodle and many more. You also get to enjoy an unlimited plate of different meats that you can pick from the menu. BBQ set meat have to be place order through their friendly staff as they want to keep the meat fresh, so when the customers order they will only take it out from the kitchen and serve it straight to your table. All dine in customers have a special chances to walk away with a trip to Jeju / Seoul, a brand new Samsung Galaxy S8 and Cash vouchers. At the end of your dining experience, customer will get a chance to fill up a form to join their lucky draw. Each month 13 lucky winner will stand a chance to walk away with dinning voucher worth up to RM1000. Every 3 months, there will be a draw for a lucky customer to walk away with a brand new Samsung Galaxy S8. Lastly will be the grand prize which the winner would get a pair of ticket for 2 to travel to Korea for a 5 Day 4 Nights trip. Not sure what to have for your lunch with colleagues, all questioning one another about where to head to? 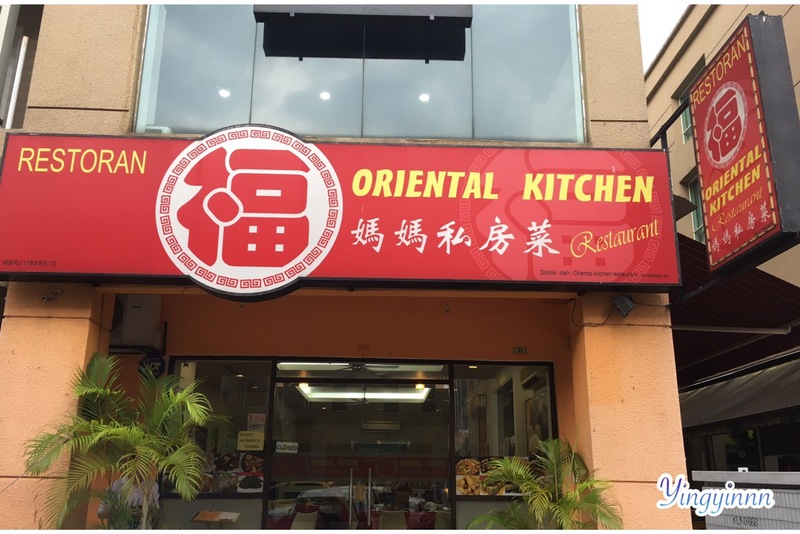 There is a Chinese restaurant around The Strand, Kota Damansara which you might be interested in. 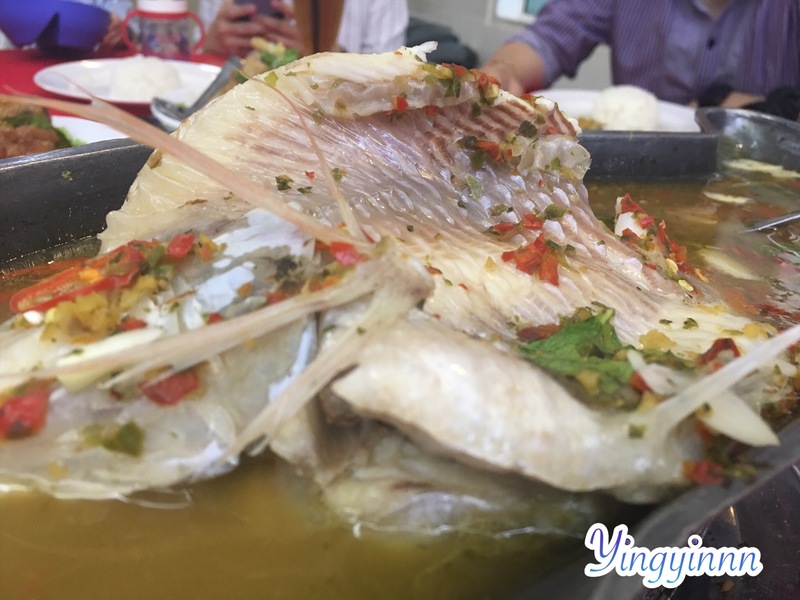 They serve a variety of food, including Prawn, Fish, Seafood, Pork, Chicken, Toufu & Egg and Vegetable. It is usually full house during lunch and dinner hour, so just to be safe, it is better to make a reservation so that you would not have to wait for your turn. I realize its quite popular among office workers who work around that area, as their price are reasonable for the portion that they provide. Want to know what is the highlight of their place? They do not charge GST as well as SERVICE CHARGE. Here are some of their popular dishes along with a few new dishes. – It’s crispy on the outside and once you put it in you mouth, it melts naturally. 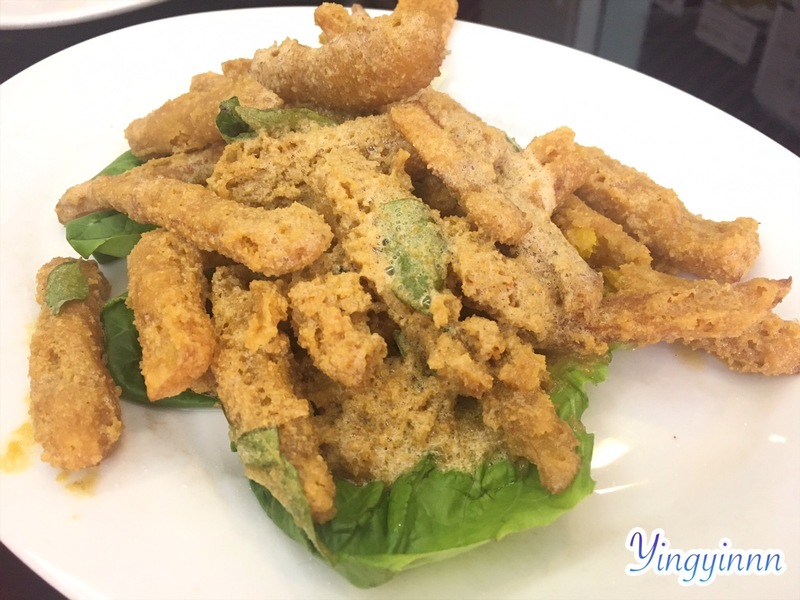 Pumpkin cover with salted egg, who doesn’t loves it? – A dish which has final touches of thousand island, thinking about it would make you drool straight out from your mouth. The meat is fresh and tender, one bite and you would wish to have another piece. – Depending on each individual, some might say it’s spicy, some might say it’s not. For me, it’s just right. They used charcoal at the bottom of the plate to keep it warm instead of candles. – If you are not much a fan of meat, then this is the dish for you. All types of different vegetables along with meat. 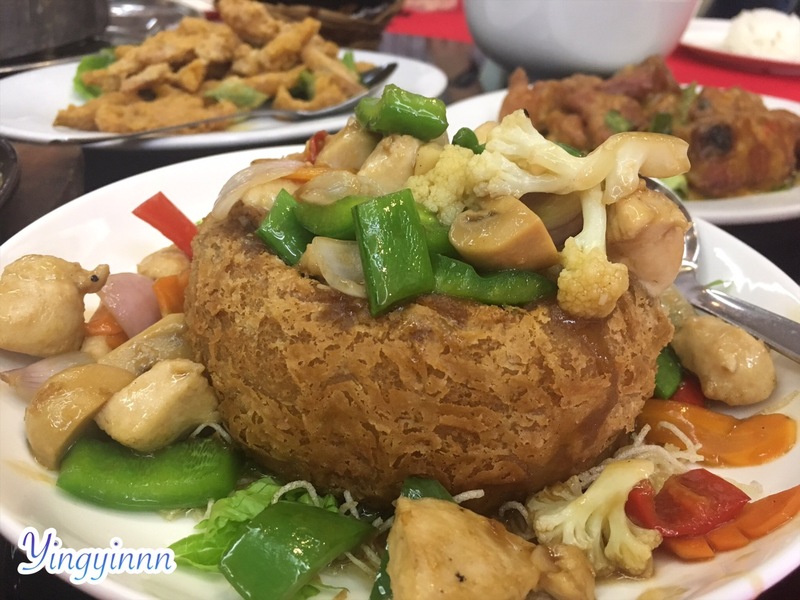 The chicken is juicy and goes well with the vegetables as well as the yam which is shaped like a bowl. – Never taste or seen anything like that before in other restaurants. Finding for something unique that you might not find anywhere else. The fish meat sauce gives out the combination of both sourish and spicy at the same time. 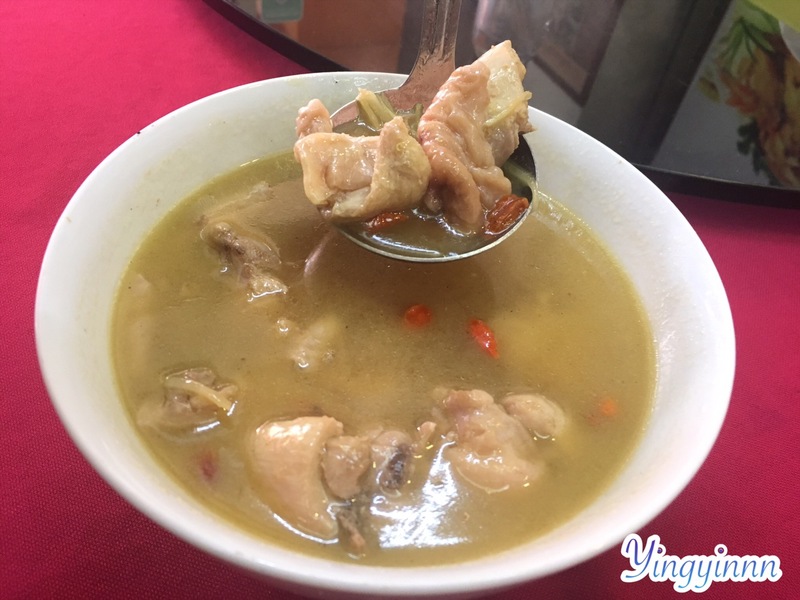 – Sick of the normal chicken with herbal soup and so on? 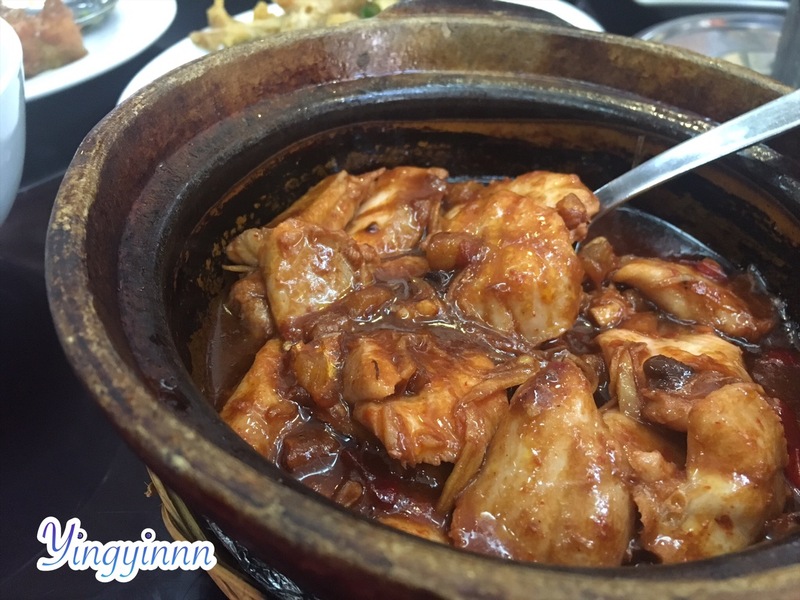 Then this rice wine chicken should be your top priority on your food list. Don’t even worry about getting drunk as the wine contains little amount of alcohol. The soup is so tasty that I could gallop the whole bowl all to myself. – Imagine having a bite from a warm, tender and scrumptious pig’s intestine. You will definitely love it! Not to forget there are dried shrimps as well which compliments this dish. The owner started this business having an intention to have a place for people who would come from different states or even overseas to refresh the memories of their parents home cooked food. As many people nowadays are busy with work and are held back by work related projects usually they won’t have enough time to make it back in time for dinner and so this restaurants main objective is to be there to serve home cooked food for the people to remind them that even here, they can provide the same love and concern that has been put into preparing all these dishes. After all, everyone would want to know who’s the chef behind all these dishes that has been made with love which is the owner’s mother. She wants to serve her homemade recipe so that everyone could have a taste of how home cooked food would taste like and to share the love through cooking. Besides that, they also provide set lunch which is as low as RM8.90 and RM12.20 (includes soup and drink). There are more than 40 different meals to choose from the set lunch. Address: No23-G , Jalan PJU5/21 , The Strand Kota Damansara , 47810 Petaling Jaya , Selangor.